His home in RI is Jens Risom's crowning mark—timeless style teaching a new generation. 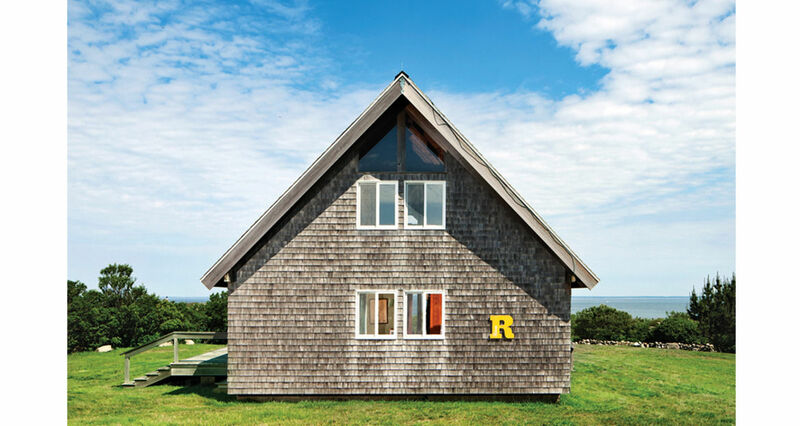 Reveling in a simple aesthetic beauty, Jens Risom’s summer home on Block Island, RI, is essentially unassuming. It’s a functional home that emphasizes the natural beauty surrounding it. But, with a bright yellow “R” on its exterior, it’s still distinctly Risom, and for the better. Risom's one of the best furniture designers of the 20th century, and his style is well tuned. Of course, he'd deflect attention—expressing that the property, house, and project have just been a love affair from the beginning. For a designer, using prefabricated materials is uncommon, but being ever the visionary, that’s exactly what Risom did—back in 1967 (and it only cost him $20,700). The contractors who built the house were quick to doubt the longevity of the project. They believed the winter weather would be too much for the home to withstand. Lucky for Risom, and the rest of this post, the house has bravely withstood more than four decades of northeastern weather. Natural light played a major role in the house's layout. The entire north wall consists of windows, allowing ample light to illuminate the fixtures of the living space within. And, for the exterior, the weathered gray wood coating the walls and wrapping the deck echo the spirit of the home's neighborhood fishing community. Risom’s A-framed summer escape, considered by many to be a staple for modular design, is even more beautiful on the inside. Widely revered for his work in modern furniture design, the living space became a personal showcase of Risom’s groundbreaking work. The dark amber of the exposed wood provides a perfect backsplash for the tables, chairs, and fixtures that furnish the home. Timeless in their design, this home’s décor reflects the life and vision of a master artist. Fifty years since its construction, this home provides a lasting example of how to make simple design endlessly alluring. The fact that Risom’s home is still praised today speaks to the elements of his own design practice. Structured around the infusion of functionality, simplicity, and elements of beauty, Jens’ work influenced the furniture we decorate our homes with today. Risom lives and works at home in Connecticut. At 97, he still visits his home on Block Island, which will always be an iconic example of contemporary design. Images by Floto + Warner via dwell.